The above copper farthing token measures 15.4 mm and weighs 0.81 grams. 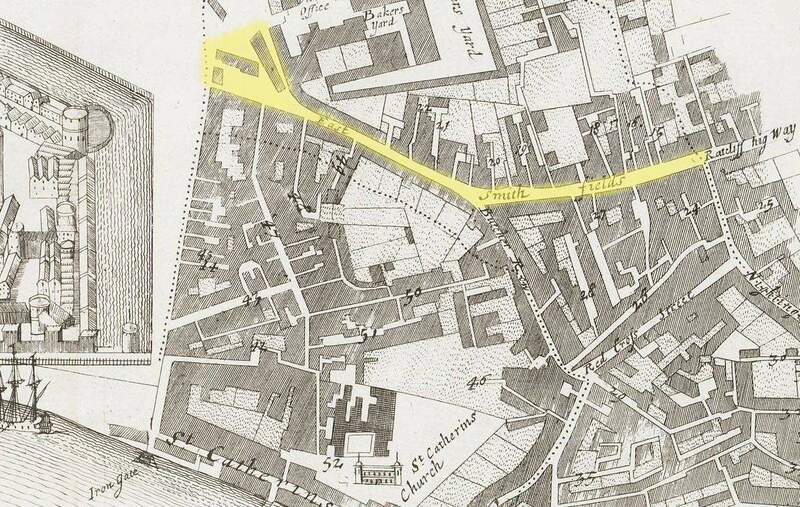 It was issued in the joint names of John Hutton and G. Jerrard and of East Smithfield, an area to the immediate east of the Tower of London which runs along the southern boundary of the parish of St. Botolph without Aldgate and the northern edge of the parish of St. Katherine’s by The Tower. This token is an interesting example of two persons, apparently of different trades, were jointly responsible for issuing a token in both of their names. Obverse: (star) I.HVTTON. G.IERARD , around twisted wire inner circle, depiction of four candles suspended from a cord strung between the ends of a crescent moon. Reverse: (star) IN.EASTSMITHFIELD , around twisted wire inner circle, wheatsheaf within. The first person listed on the obverse of the token, i.e. J. Hutton, has been identified as John Hutton who, given the appearance of a string of candles on the obverse of the token, may have been a tallow chandler who possibly operated at the sign of the Half Moon in East Smithfield. In the Hearth Tax returns for 1666 there is a listing for a John Hutton paying tax on 3 hearths “street side” in St. Botolph Aldgate. The second individual listed, G. Jerard, has not been identified. It has been postulated that the reverse sign of a wheatsheaf may imply that he was a baker. Alternatively he may have been alternatively employed in a different trade operating from the sign of the Wheatsheaf in East Smithfield. The sign of the Wheatsheaf in combination with other objects has been noted as being used by haberdashers, lacemen, woolen draper. mercers and sundry others by Bryant Lillywhite in his book “London Signs”. Great work – keep going !